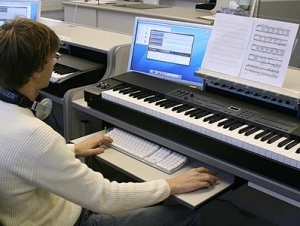 Starting in summer 2014, music educators seeking a master’s degree will have a unique opportunity to earn one completely online through Buffalo State. The State University of New York recently approved a new master’s degree in music education that Buffalo State’s Music Department will offer in the distance-education format. Buffalo State is one of only 10 higher education institutions in the nation to offer an online graduate music education degree. However, Fuster said the department plans to keep the program small, admitting just 15 students each year, much like Buffalo State’s esteemed art conservation program does. Current music faculty will teach the online courses, and Victoria Furby, assistant professor of music, will serve as the program coordinator. The faculty will integrate videos with Web 2.0 to interface with students. There may be some electives offered on campus as well. The program is offered in a part-time format that will enable working professionals to complete the master’s in five semesters. Courses will include Graduate Music Theory, Graduate Music History, Research in Music Education, Curriculum and Assessment, and Conducting and Ensemble Leadership.